Graphene is a recently developed material, which consists of a single layer of carbon atoms that forms a sort of 'chicken wire'. The researchers from the programme 'Graphene-based electronics' are studying the possibilities for using this material in electronic applications. Much of the pioneering work with graphene, both within and outside of FOM, has been done on graphene that has been peeled off from graphite using sticky tape. This production method has its limitations. Pieces of graphene obtained with this method have a diameter of at most 10 to 100 micrometres. It is also a time-consuming process with a poor reproducibility. Therefore efforts have been made within the programme to find a new method for producing graphene that can be scaled up to an industrial process, such as chemical vapour deposition (CVD). A copper substrate is exposed to a carbon-containing gas at a temperature of 1100°C. Graphene then grows on the substrate. By carefully choosing the conditions, a single layer of graphene can be grown with monocrystalline areas of no less than a millimetre in diameter. An important characteristic of graphene is that electrons can travel through it without being scattered: so-called ballistic transport. However, this is only possible in perfect graphene. Errors in the lattice and grain boundaries scatter the electrons thereby disrupting the ballistic transport. If ballistic transport occurs in the graphene the researchers produced using CVD then that would unequivocally demonstrate the very high quality of this material. The researchers in this programme from Delft University of Technology have managed to produce graphene using CVD, make a device from this graphene and demonstrate ballistic transport in it. 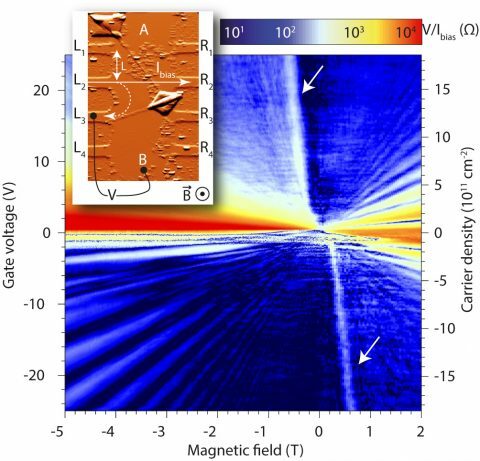 Ballistic transport was demonstrated by placing a weak magnetic field perpendicular to the graphene. As a result of the magnetic field electrons bend way from a first contact towards a second contact without being scattered. This effect is called transverse magnetic focusing. The figure shows that transverse magnetic focusing occurs for the expected combination of magnetic field strength B and Fermi velocity vF. The bent lines (white arrows) can be ascribed to the transverse magnetic focusing. Inset: atomic force microscope image of the device and by way of illustration the measurement configuration used for the measurement.